Custom Imprinted Woodtone Mirrored Malibu Sunglasses are presented with Lime Green, Red, Purple and Blue color options. These custom sunglasses are made up of polycarbonate material and also consist of UV400 lenses which have the ability to provide 100% UVA and UVB protection to the customers. The 2" W x ¼" H imprint area can quickly make your brand seen by people around. Order these Custom Malibu Sunglasses with Iridescent Mirrored Lenses quickly and grab our free online proofs and free professional design services. 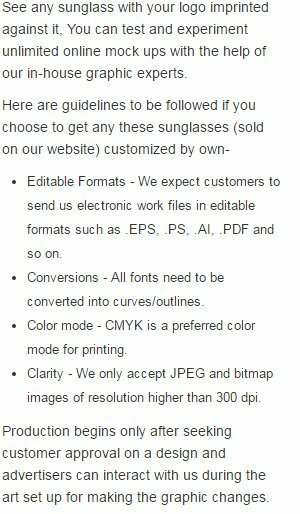 Request a quote to know what you can save on ordering Custom Imprinted Woodtone Mirrored Malibu Sunglasses.